Are you trying Veganuary? Or have you simply resolved to eat better or eat less meat this year? 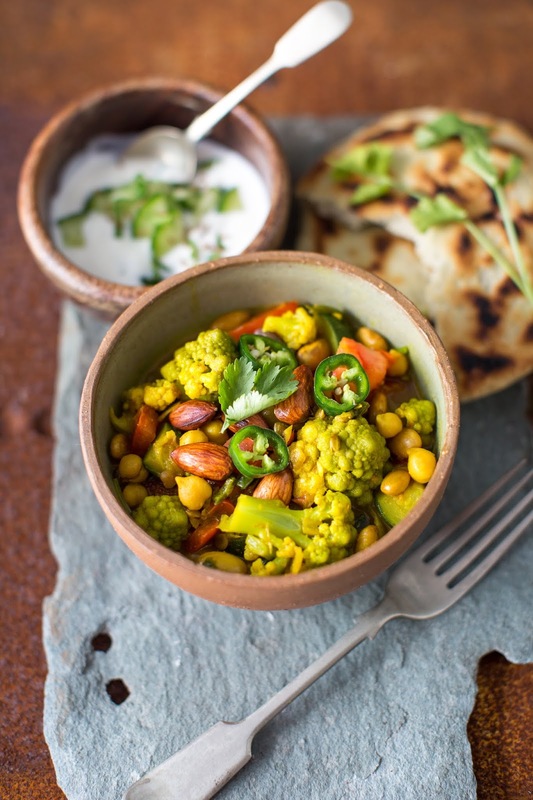 Either way, this delicious vegan curry from award-winning chef Mark Hartstone is the perfect choice for dinner this week. Mark has a wealth of experience working with a host of top chefs, including a stint at Le Manoir aux Quat' Saisons. Now with his own venture, La Fosse in Cranborne Dorset, Mark offers a range of dishes including a great vegan and vegetarian range. This vegan curry is served with a simple raita and a delicious dukkah to dip your flat bread in. Yum! A great condiment for jazzing up dishes, especially to serve with bread and oil. Dip your bread in an oil, followed by the dukkah. 1. Roast the nuts and seeds until they are a rich nut brown colour. 2. Leave to cool. Then blitz in a processor till they are a coarse grit like texture. 1. Sweat off the spices in the oil with the onions, then add the vegetables. 2. Add the liquid ingredients and simmer. 3. Add the nuts and chickpeas. 4. Continue cooking on a medium heat until the vegetables are just cooked (usually 20mins but dependent on veg and size of veg). 5. Add the roughly chopped coriander just before serving. 1. Mix all the ingredients together, chill until you serve.